Driving along Great Yarmouth's Golden Mile at lunchtime today I observed three of Shearings Setras in close proximity to the Carlton Hotel. All were in Grand Tourer livery with two of them parked immediately outside the hotel in Kimberley Place. The two there awaiting their passengers were 101 (BK09RMV) above and 201 (BK10EJA) below. More than half a century since it was new to Great Yarmouth Corporation, Leyland PD2 No 66 (EX6566) briefly returned to its former Caister Road depot on Saturday last. 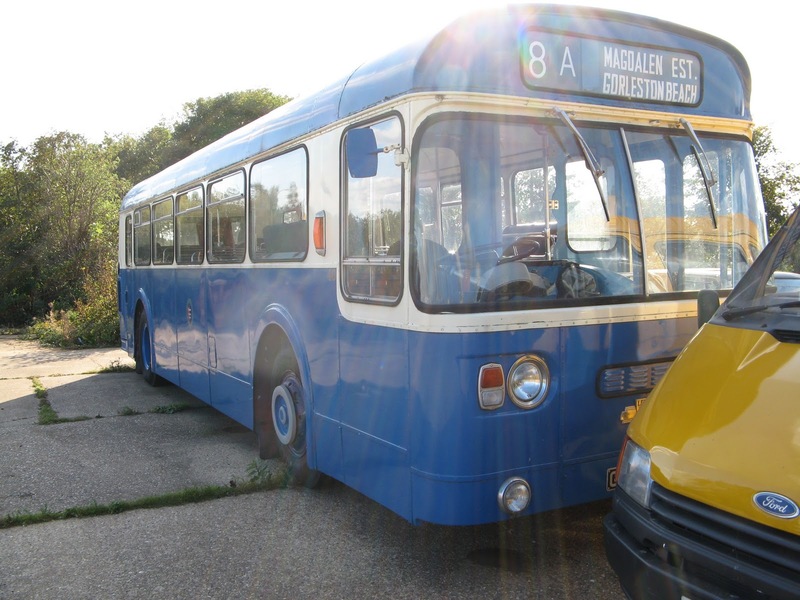 Its current owners, the East Anglia Transport Museum, was using it to collect some redundant bus glazing items . The glazing items were previously used on some 1960's/1970's period vehicles and some will be used on vehicles in the EATM collection. Others will be passed on to other bus preservation organisations. No 66 gave 17 years of service on the east coast prior to being sold to Mulleys of Ixworth for further use. In 1984 it went into private preservation in Essex subsequently being owned by Headingham Omnibuses until donation to the East Anglia Transport Museum three years ago. Green Ace Gorleston, shown on the destination screen, was a bus terminus named after a garage/petrol filling station situated at the current Lowestoft Road/Middleton Road roundabout on the A12. Public transport users in Great Yarmouth and the surrounding area have the chance of having their voices heard at a forthcoming special public meeting. The East Norfolk Transport Users' Association has lined up speakers from the area's leading transport providers which will give the opportunity for members of the public to raise their concerns about local rail and bus services. Representatives from Norfolk County Council's Public Transport Team, First management and rail operator National Express East Anglia will each provide short presentations as well as answering questions from the floor. 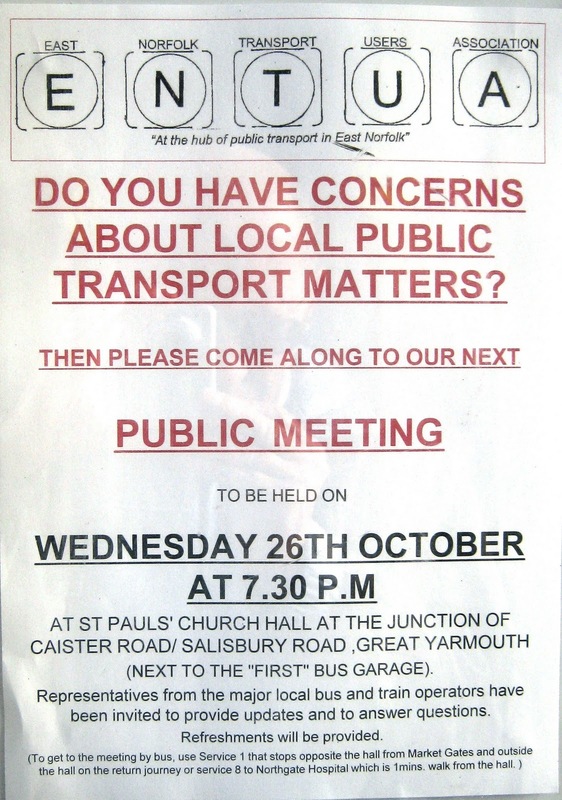 The meeting will take place on Wednesday October 26th at St Paul's Church Hall in Great Yarmouth from 7.30 pm. St Paul's Church Hall is located at the junction of Caister Road and Salisbury Road close to First's Caister Road depot. 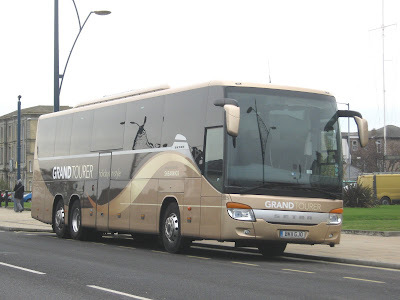 Nottingham City Coaches FP02YDK was parked up at Great Yarmouth's Beach Coach Station early yesterday afternoon. She was one of nine on site at the time - a relatively high number considering that summer has long gone. 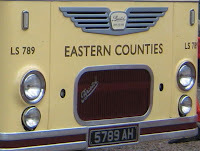 I am pleased to offer to blog readers an Eastern Counties Omnibus fleet list history and, what's more, its absolutely FREE! 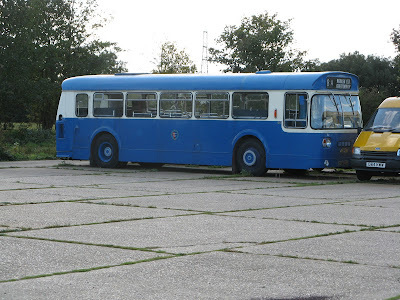 Regular contributor Syd Eade has provided this fleet list showing all the buses owned by Eastern Counties and its associated companies (eg Great Yarmouth Transport, Flying Banana Buses etc). The listing also includes vehicle disposal details too. Syd has prepared the information for his own use/interest which was obviously quite a large task. However, he thought that it would be useful and of interest to others and is prepared to offer a copy to you at no charge. I have spent some time looking through this and the memories of the vehicles and operators came flooding back. An invaluable tool for aficionados of Eastern Counties vehicles! How do you get a copy? Just email Syd at cranks@lordraglan274.plus.com and he will email you a copy by return. You won't be disappointed! Syd is awaiting your emails now. I am very grateful to Syd for making this information available. 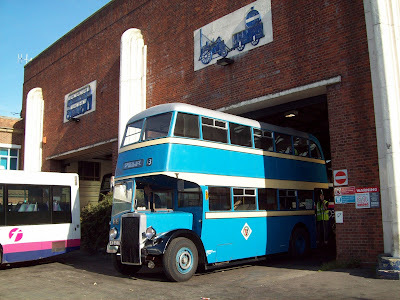 First Eastern Counties Leyland Olympian 34333 (H132FLX) has finally been withdrawn at Great Yarmouth's Caister Road depot. This was the last Leyland Olympian in service with First Eastern Counties. Originally expected to be withdrawn at the end of August, she has limped along (no pun intended!) until mid October. H132FLX last saw use on Friday 14th October before being parked up for the final time. 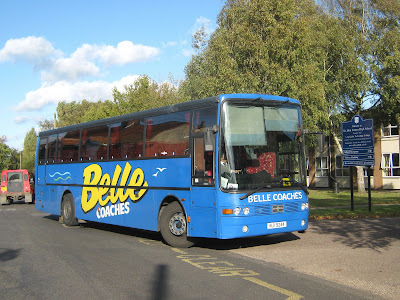 I visited Beccles yesterday afternoon to note any changes since my last visit on 29th September, almost three weeks ago. 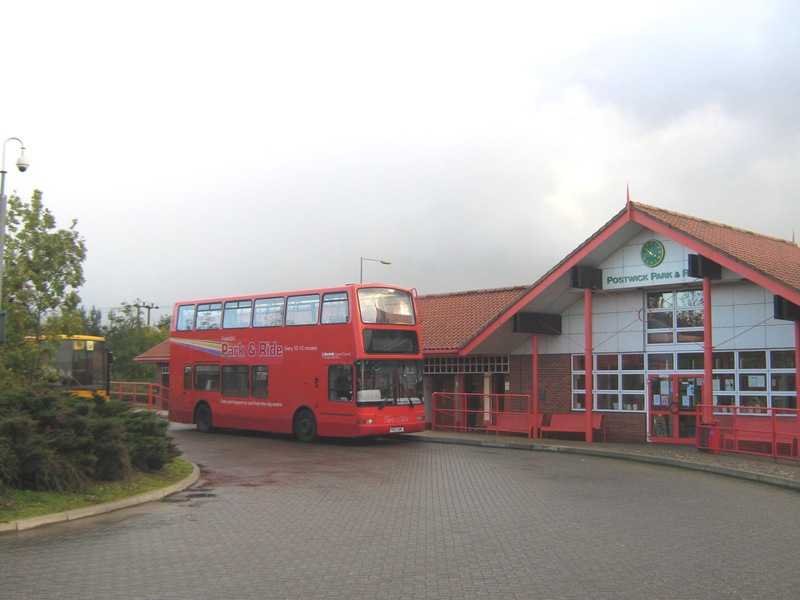 My first port of call was the Sir John Leman School where an Anglian Scania Omnicity was present on the forecourt. Shortly before 3pm Nightingale's orange liveried Leyland Olympian F633LMJ arrived; to be followed shortly thereafter by Belle Coaches' Van Hool NJI9244. 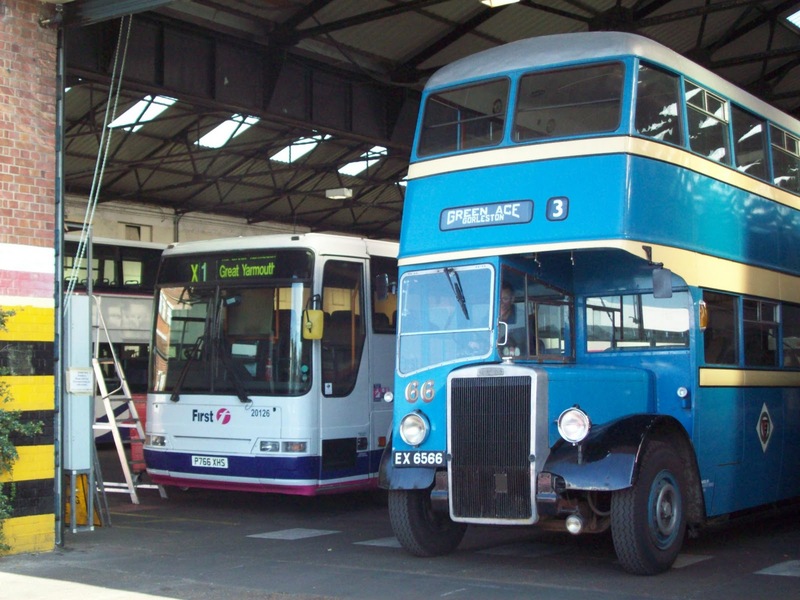 It was then off to the bus station where Anglian's Olympian 507 (HIL7618) and Trident 509 (X309NNO) both put in an appearance. During the interval between the two deckers, Galloway's Van Hool 266 (AY08DXF) passed through. 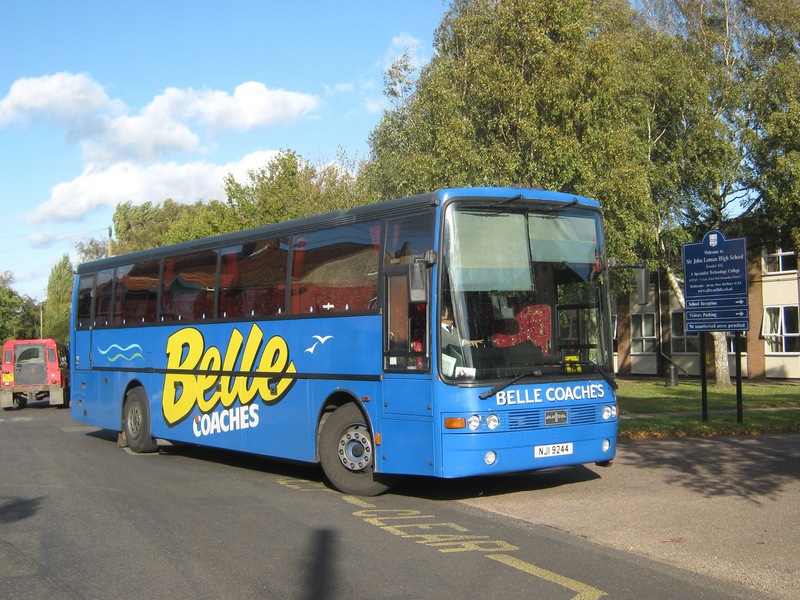 Beccles still provides some interest when school journeys are in operation. This weekend saw a further visit to the Midlands, this time centred on Lichfield in Staffordshire. Again there was the chance of viewing some bus activity! What better place to view the comings and goings than the smallish bus station opposite Lichfield City Railway Station. However, with its north east/south west alignment it wasn't very good for afternoon photos with the camera facing directly into the sunshine! 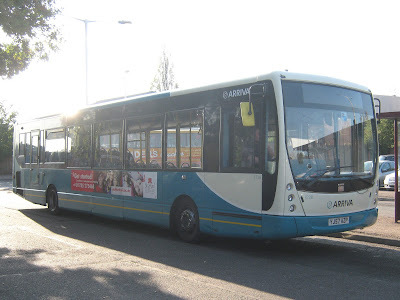 It was quite obvious that Arriva Midlands seem to be the major player in Lichfield - quite a pleasant change from the dominance of First in the Great Yarmouth area! By using the shade of the trees I managed to photo Arriva's 3738 (YJ57AZP) below arriving in the bus station. Next up was Central Connect's 6513 (BX56BPU) in Flights Hallmark branding. The Enterprise Plasma is seen on Birmingham Road which runs parallel to the bus station allowing me to get a better picture..
A red liveried vehicle next - this time in the form of a Midland Dart. Looking smart in the sunshine was Oldbury- based 2153 (P153SMW) on the 991 service. As if it was trying to balance up the bias of the photos taken, another Central Connect Plasma entered the bus station. This time it was YX56JUC, again viewed through the shade of the tree. Finally, lurking in the corner of the bus station was a Norfolk vehicle! 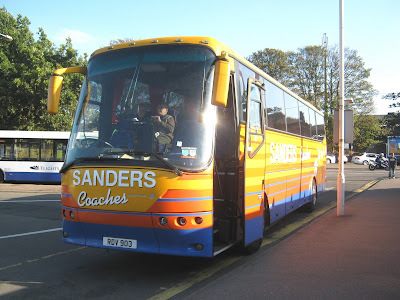 It was a surprise to see Sanders DAF/Van Hool RDV903 present. 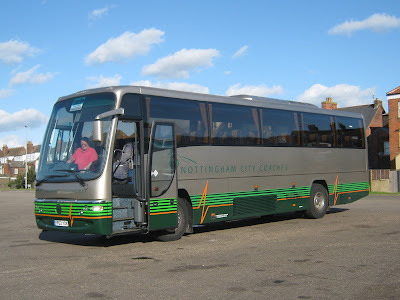 It looks as though it was having a short break whilst most of its passengers were exploring the city. Anglian was using a StreetLite on its 581 service yesterday on the 16.00 from Great Yarmouth to Beccles. 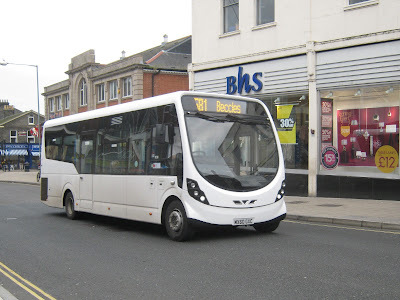 Nothing unusual in that I hear you say, but this time it was white MX60GXC which was captured passing bhs on Regent Road in the town. The StreetLite has been given fleet number 327 by Anglian and it is not known whether it's on loan or has been acquired by the Beccles-based company. There is also a picture on Flickr showing it operating in the Worcester area for Astons (Veolia). 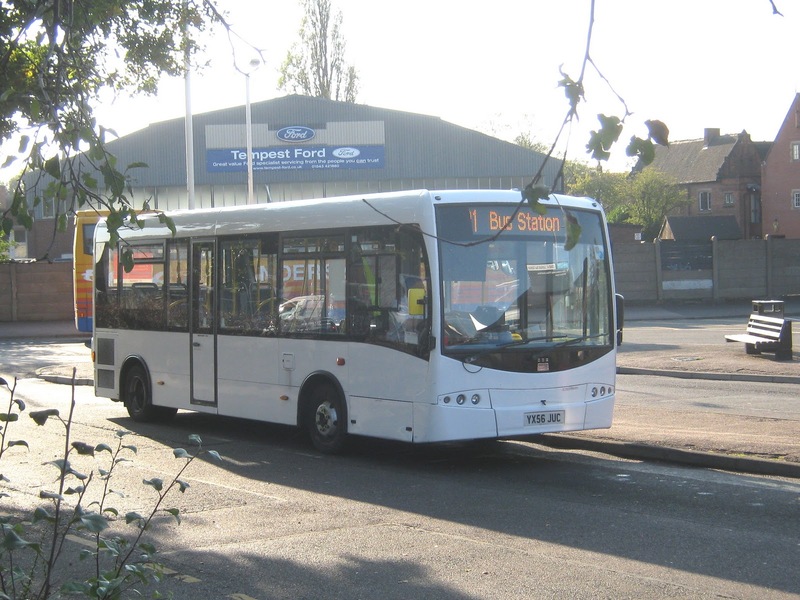 Good news for East Norfolk residents is that the Postwick Park and Ride is to reopen on Saturdays from 22nd October in time for the run up to Christmas. 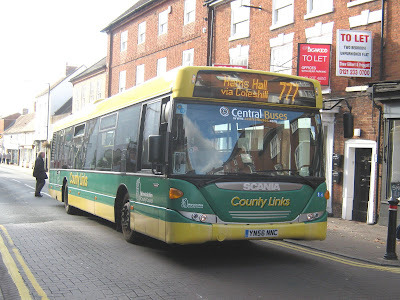 Saturday services were suspended last April as part of Norfolk County Council's overall spending reductions. 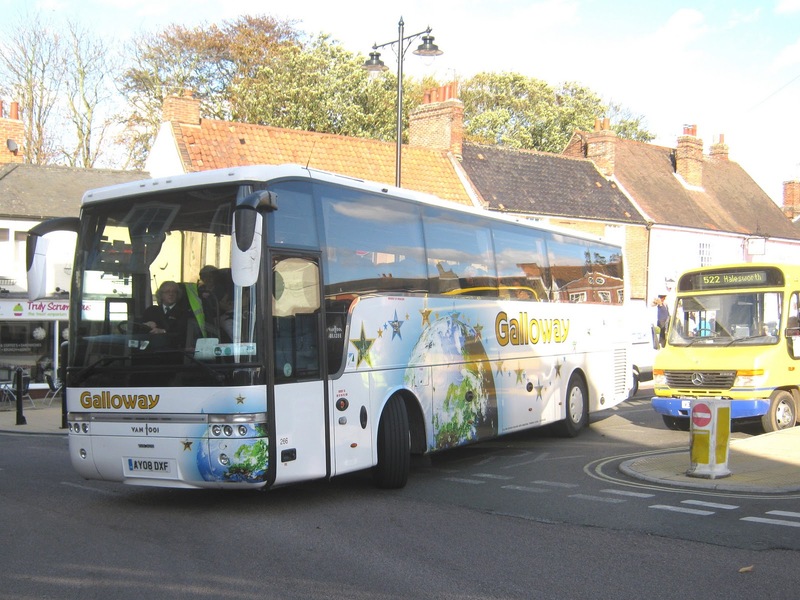 A report in yesterday's Eastern Daily Press says that by linking two services buses will alternate between Postwick and Sprowston with no increase in journey length and time for customers, but a more reliable service. 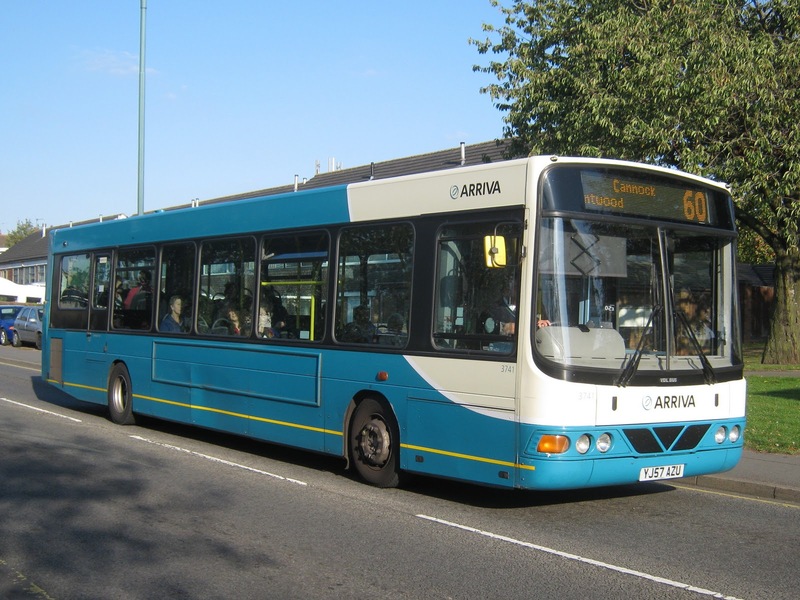 Norwich park and ride buses are colour-coded according to the site they serve, and customers will see a slightly revised panel on the front of Postwick and Sprowston buses, with very clear destination displays to help passengers recognise a bus going to their parking site. An early afternoon visit to Great Yarmouth's Beach Coach Station revealed only one coach present; one of Shearings' Setras. It was 127 (BK09LUT) which is pictured at rest on a gloomy afternoon - at least it wasn't raining! 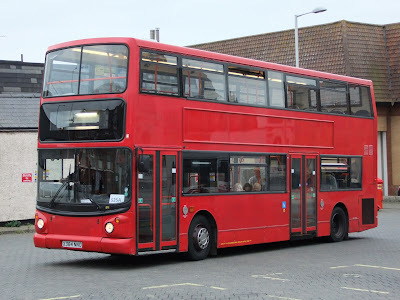 Grahame Bessey reports that Anglian's latest Trident arrival was in Lowestoft Bus Station late yesterday afternoon returning to Beccles on the 525 service. Still in London red colours, No. 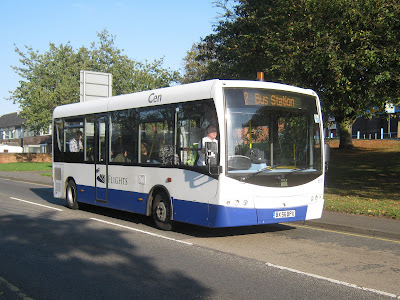 511 (X384NNO) had just worked the 525A schools service from Sir John Leman School in Beccles to Carlton Colville in Lowestoft. Tim Major reports that he was on a tour of inspections in the rural area of Great Yarmouth and came across this spectacle! 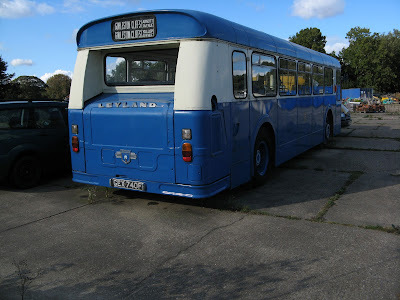 It was a former Great Yarmouth Transport Leyland Atlantean PDR1/1 single decker﻿ and fortunately Tim had his camera with him to record the event. GEX740F (formerly number 40 in the fleet) was one of three purchased by the Great Yarmouth undertaking in March 1968. 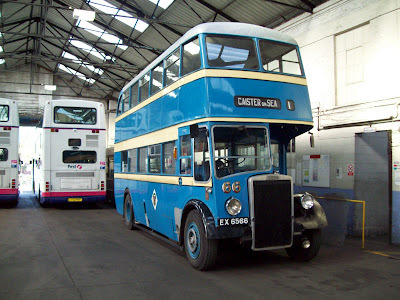 They were a rare example of the usual double deck chassis purposely built as a single decker. After being sold and stored in North Yorkshire for a while, No.40 spent some time in Hertfordshire prior to being acquired by a private owner and is now based locally. The vehicle still retains its rear destination screen, although the operator began to dispense with this practice during the time when its AEC Swifts were in regular use. I can remember many a note to a certain Terminus editor about this! The gloriously warm weekend weather coincided with a short break in the East Birmingham area. In addition to catching up with friends and family, I did manage a few bus photo opportunities! Arriving in Coleshill (east of Birmingham off Junction 4 of the M6) on Saturday afternoon, I caught sight of Arriva Midlands North Scania 3809 (YN08HZW) in the High Street on the 115 Tamworth to Coleshill nearing its final destination. Following a swift cuppa, we headed to our B & B for the next two nights in Sutton Road in Birmingham. ﻿It was decided to explore the local shopping area of Wylde Green where National Express West Midlands Volvo B7TL 4497 (BJ03EXF) was noted heading west on the 915 service to Birmingham City Centre. A stroll down Penns Lane saw National Express West Midlands Trident 4730 (BV57XHT) heading towards us on the half hourly Sutton Coldfield to Birmingham City Centre 115 route. Sunday was spent with relatives; whilst Monday allowed for only one shot of Arriva Midlands North Volvo B9TL 4202 (FJ08LVN) photographed from the B&B in Sutton Road. Its destination was Tamworth on the 110 service. Tuesday provided some time for photos, with three different operators seen in Coleshill High Street﻿. The first photo is of Central Buses Dart KG52VAA on the 09:02hrs 757 service from Whitacre Heath to Sutton Coldfield via Coleshill. As can be seen from the above photos, bus operations through the area offer a variety of vehicles in different liveries.